Beach Sandals is a colorful, cozy North Myrtle Beach, South Carolina condominium complex that is just across the street from the Atlantic Ocean and its miles of shimmering white beach. Featuring four comfortable vacation rentals, each accommodating a group of two, Beach Sandals is ideal for a romantic getaway--or rent the entire complex and bring the whole family with you on your North Myrtle Beach vacation! Your North Myrtle Beach vacation is sure to be a success when you reserve a vacation rental at Beach Sandals. 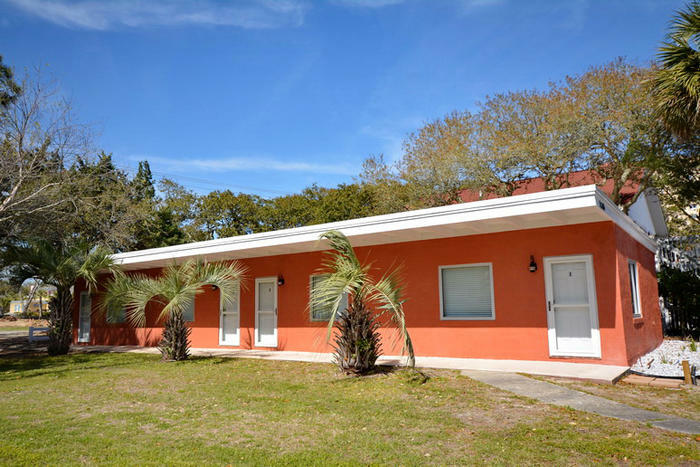 Avoid the crowds that surround the large high-rise North Myrtle Beach condominium resorts and settle in to this homey condo complex. You and your guests will have just a short walk to the beach, so bring your bathing suits and sunscreen with you to North Myrtle Beach—you are going to be spending a lot of time in the sun and sand! Catch up on your reading in a comfy beach chair along the water as the kids frolic in the waves or build sandcastles. Enjoy a game of beach volleyball or Frisbee, or search for colorful seashells along the shore. Take a snorkeling lesson, go parasailing or do some surfing. After a fun day on the beach, head back to Beach Sandals and throw some burgers on the grill and enjoy dining outdoors in the refreshing breezes coming off the ocean. It does not get any better than this! The air-conditioned vacation rentals at Beach Sandals each comfortably accommodate a group of two, who will appreciate the efficiency kitchen, dining area, wireless Internet and television that these units provide. Another plus--Beach Sandals is pet-friendly with a $300 deposit—with your favorite four-legged friend along with you, this lovely North Myrtle Beach vacation rental will really seem like home! Beach Sandals is located in the popular Crescent Beach area of North Myrtle Beach, which puts it close to all of the North Myrtle Beach attractions that you are looking forward to exploring on your North Myrtle Beach getaway. This area of South Carolina is a desirable vacation destination, due to its fabulous golf courses and shopping areas, huge selection of restaurants and exciting live entertainment. All of this, combined with its close proximity to the beach and all the water sports that the Atlantic Ocean provides makes Beach Sandals rental the ideal North Myrtle Beach condominiums for a memorable North Myrtle Beach vacation! Elliott Beach Rentals is not affiliated with onsite management or the HOA of Beach Sandals.